White and Wild Asparagus – Where? White asparagus is in full bloom on produce shelves and farmers markets — but not in my usual markets. 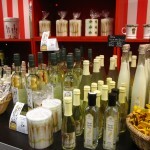 While visiting my daughter in Berlin and a cousin in Paris this month, menus were bursting with ‘Spargel’ (Germany) or ‘asperge’ (France) in soups, salads, entrees and even desserts. See photos below. 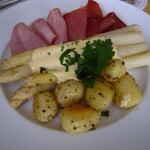 I think white asparagus is sweeter tasting than green, almost butter-like, and the tip stronger flavored than the stem. The stalks tend to be very thick, which seems to be the delicacy, yet they are tough if not heavily peeled. Some of the vendors I spoke with claimed their special selection – as in higher price – didn’t need peeling, but in my one test that wasn’t true. In France I also saw wild aspargus with spaghetti-thin stalks and darling miniature tips. Mild flavor and fun to eat. 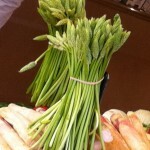 Asparagus ushers in spring and makes quite a spectacle in European markets. It’s so esteemed they even make novelty asparagus liquors, cocktails, vinegar and ice cream. I didn’t sample any, but my daughter tells me they are quite ‘lecker’! (very delicious in German) Back in the California, my favorite way to prepare asparagus is brushed with olive oil and salt, then grilled about 5 minutes on a hot barbecue, just until tender-crisp. Or, steam and top with walnut gremolata, another favorite I posted last year. 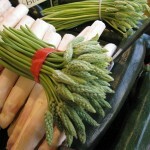 Wild asparagus is widely available in France. Wild and white asparagus at a Paris market. 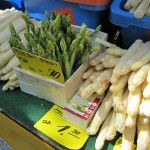 White asparagus costs as much as 8 euros ($12) for 2 kilos (4.4 lbs), green was 2-3 euros. 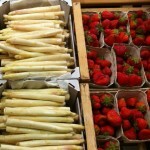 Markets often display white asparagus with strawberries or cherries for vibrant color contrast. 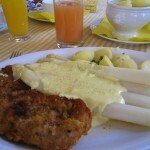 Schnitzel with white asparagus and hollandaise. 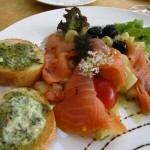 Lox salad with sliced white asparagus and herb bread. 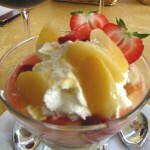 Whipped cream and vanilla sauce parfait with sugar poached asparagus, for an apple-like flavor and crunch. 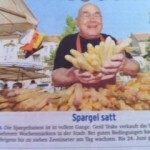 An enthusiastic asparagus farmer pictured in a German newspaper. 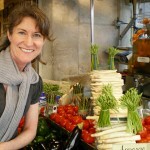 ….and Rosie at the market.